Pyrolysis of scrap tyres produces oil that can be used as liquid fuels for industrial furnaces, foundries and boilers in power plants due to their higher calorific value, low ash, residual carbon and sulphur content. The Gasolysis Reactor is designed to handle waste tyre. The reactor operates at high temperature and in absence of Air. At high temperatures the polymers are Gasolysied to small chain hydro-carbon linkage. The Vapours produced are condensed in the Condensers and collected as crude oil. The non-condensable gases are the Product Gas – Fuel Gas is then compressed and stored for further utilization of heating process. Remaining product is carbon which is also used as burning purpose. Batch system provides Self-sufficiency for fuel consumption (typically for industrial/commercial) fuel requirement. Well-engineered plants ensuring superior quality of Products and assures safely while operating the system. The plant can suitably be operated up to 40 % turndown. 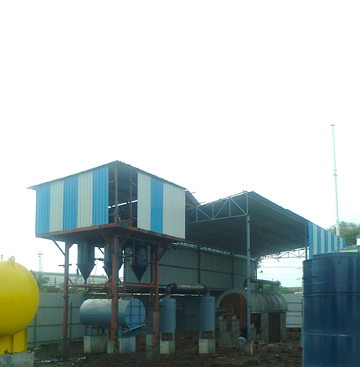 Eco-friendly Process, no harmful gases/effluent produced.